Leave a Guinness out for Santa this Christmas. It’s Tradition! True: In Ireland, it is tradition to leave mince pies and a bottle of Guinness out as a snack for Santa. After all, Santa has a long journey, not much time, and so fortification seems like an excellent idea. And, children often put out Christmas sacks instead of stockings, in the less Americanized parts of Ireland. Christmas in Ireland lasts from Christmas Eve to the feast of the Epiphany on January 6, which is referred to as Little Christmas. Ireland’s Christmas is more religious than a time of fun. Lighted candles are placed in windows on Christmas Eve, as a guide that Joseph and Mary might be looking for shelter. The candles are usually red in color, and decorated with sprigs of holly. Irish women bake a seed cake for each person in the house. They also make three puddings, one for each day of the Epiphany such as Christmas, New Year’s Day and the Twelfth Night. After the Christmas evening meal, bread and milk are left out and the door unlatched as a symbol of hospitality. St Stephen’s Day, the day after Christmas, is almost as important, with football matches and meetings going on. For children, the Wren Boys Procession is their big event. Boys go from door to door with a fake wren on a stick, singing, with violins, accordions, harmonicas and horns to accompany them. The reason for the ceremony is to ask for money ‘for the starving wren’, that is, for their own pockets. 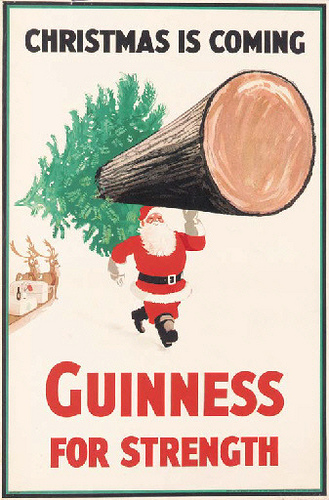 This year, join the tradition, and leave a bit of Guinness out for Santa. We are quite sure he’ll appreciate it.